Urinary incontinence is the loss of bladder control. It means that a person may urinate suddenly or may be unable to withhold urination long enough to reach the toilet. It is a common problem, especially in the elderly, affecting quality of life and even leading to depression in some cases. Urinary incontinence is often associated with other diseases, particularly those affecting the nerves and muscles responsible for normal bladder action. Therefore in the elderly, patients with conditions like Parkinson’s disease, who have suffered a stroke and are debilitated are more likely to suffer with incontinence. The main symptom of urinary incontinence is leaking of urine. This cannot be quantified – it may be as minor as small trickles of urine or complete emptying of the bladder instantly. There are various different types of urinary incontinence – the main ones being stress, urge and overflow incontinence. Stress incontinence involves leaking of urine upon stress on the bladder (by coughing, laughing, sneezing, lifting weights, or exercising). It is caused by weakening of the ring-like muscle (sphincter) of the bladder. Removal of the prostate gland in men and pregnancy, childbirth and menopause in women can lead to stress incontinence. Urge incontinence involves an involuntary leaking of urine upon a sudden and intense urge to urinate within a few seconds to a minute, often before reaching a toilet. Urinary tract infections (UTIs), bowel problems, bladder irritants, stroke, Alzheimer’s disease, Parkinson’s disease, multiple sclerosis, or injury may cause urge incontinence. Urge incontinence is also called overactive bladder if there are no known reasons for its existence. Overflow incontinence is constant dribbling of small volumes of urine from an overfilled bladder. A blocked urinary bladder tube (urethra), damaged bladder, prostate gland problems, or nerve damage (e.g., in multiple sclerosis, diabetes, or spinal cord injury) can cause overflow incontinence. Mixed incontinence shows symptoms falling in more than one group. Functional incontinence involves a delay in reaching the toilet in time due to some physical or mental impairment. Total incontinence involves continuous or periodic leaking of large amount of urine, throughout the day and night. Neurological disorders like Parkinson’s disease, multiple sclerosis, stroke, spinal injury, or brain tumors. Treatment depends on the type, severity and the underlying cause. 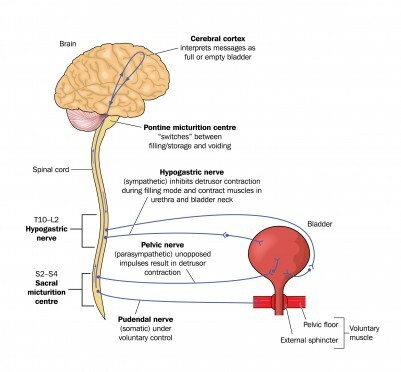 Behavioral techniques like bladder training (delaying urination after getting the urge), double voiding (urinating twice to empty the bladder more completely), controlling the urges to urinate, and timed urination (going to the toilet periodically) manage continence in many people. Lifestyle changes like fluid and diet management (avoiding caffeine, alcohol, or acidic foods), liquid consumption reduction, exercises, and weight loss often help. Physical therapies include strengthening the urinary bladder and pelvic floor muscles using Kegel exercises or electrical stimulation. Medical devices like urethral inserts (act as a plug) or stiff rings called pessary (hold up the bladder) may be used. Interventional therapies like injections of bulking agents into tissue near the urethra help to keep it closed. Implanted nerve stimulators help control the bladder. Catheters and absorbent pads help ease the inconvenience and discomfort of leaking urine. Surgical procedures are reserved for severe, treatment-resistant patients and may include sling procedures (using a pelvic sling around the bladder neck and urethra) to keep the urethra closed. Lactose Intolerance is incurable, but the symptoms may be prevented by avoiding milk and other dairy products.